Converts the selected properties to expressions and adds the current value. 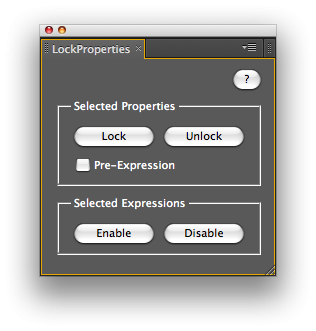 This locks the property with this value and it ignores any keyframes. This is useful for adjusting keyframed values at a different time than they are set at. It can also enable or disable the selected expressions. When there is an expression, the script locks the property and also stores the expression so that when unlocking the property goes back to its original state.